I am still getting back to the routine after a hectic and fun filled India trip. I thought i will take my camera from Monday but i can't stay away from that. While returning back from India, in the flight, we are served with Moong dal puttu in the flight. It was a small portion but tasted very well. Me and Suresh happily relished the puttu and recalled all the wonderful moments about the trip. 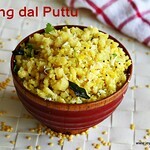 From yesterday i was thinking i should make this moong dal puttu at home. Finally i made this for breakfast and we both enjoyed this moong dal puttu again. It turned out almost the same which we had in the flight. 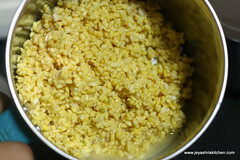 Soak moong dal in water for an hour. After an hour drain the water and grind this into a smooth paste along with little salt. 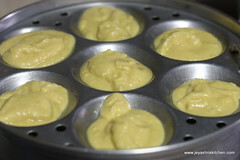 Steam this in a idli maker for 10 minutes. 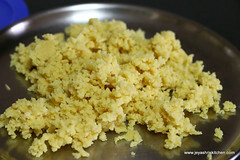 Allow this to cool and grind this in a mixer like how me make for paruppu usili. 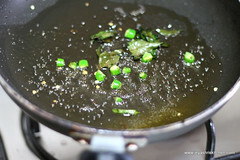 In a pan add oil, mustard seeds , curry leaves, chopped green chillies and asafoetida. 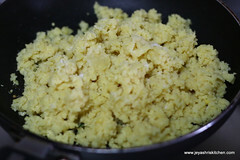 Add the moong dal and add sugar to this. 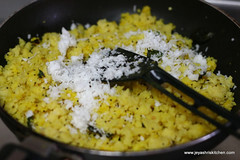 Add turmeric powder and the grated coconut. Mix well and add coriander leaves and cook for 2-3 minutes in a low flame. 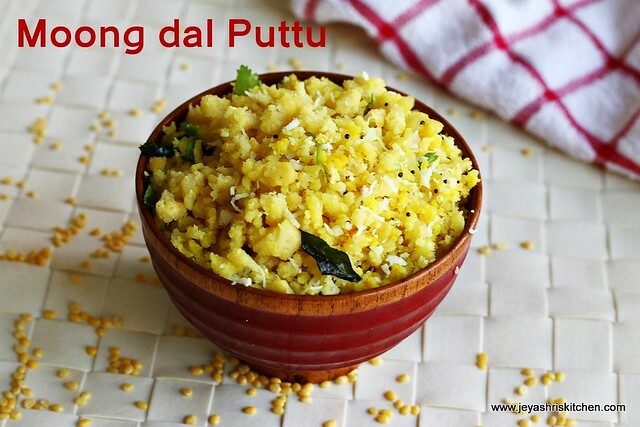 Ensure the moong dal is well cooked while steaming. 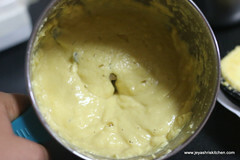 Else while grinding the mixture will be soggy. 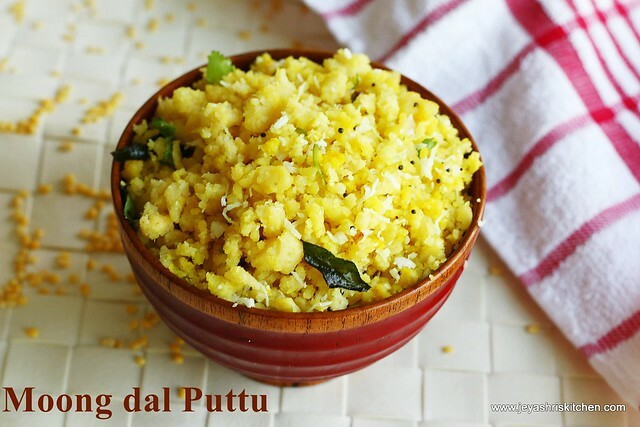 Do not over cook the steamed mixture else the puttu will be dry. 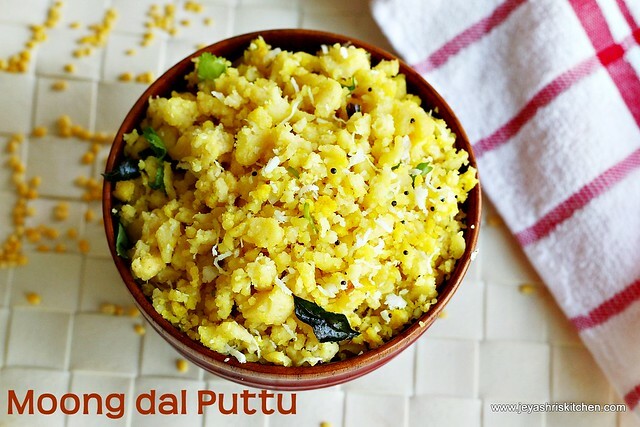 You won't get soft puttu. 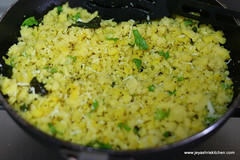 Excellent and a very different recipe Jeyashri. Will try this soon. wow! healthy puttu. looks yumm..
yummy, easy to make. After tasting my amma says - everyday is jeyashri's kitchen day. i tried this puttu. i felt that the raw smell of moong dal. it means that should i steam it for some more time. Hi thanks for alovely recipe. I made it todaya nd it came out beautifully fluffy and tasty. Just to share asmall modification- I ground the dal with the ginger and green chilly and salt before steaming and the flavor was very good. Thanks again for an awesome, nutritious and easy to follow recipe! We can have this as such. A typical Kadala curry will go well too. 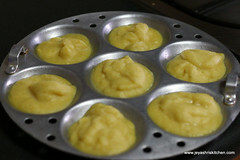 Check out the recipe index for recipe.